Note: This article assumes you have set up the Windows Certification Authority with the correct Smart Card certificate templates (see articles on Setting up a Smart Card for Self-Enrollment for the Windows Server version being used). In addition the PC on which you are enrolling has to be joined to the Domain from which the certificate is issued. 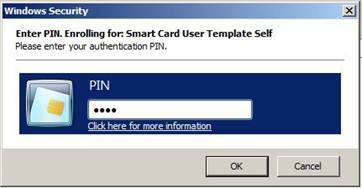 To self-enroll a smart card certificate for yourself , ensure you are logged in as the correct user and run MMC.exe. The MMC console will appear. Select "Add Remove Snap-in" from the File menu. Select Certificates and then "My User account" or "Current User". Note this may default for you. 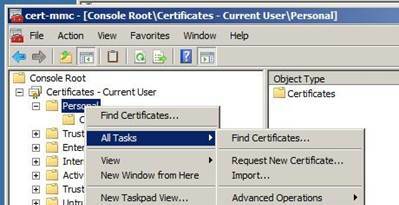 Under "Certificates - Current user," right click the Personal folder, select "All Tasks" and select "Request New Certificate"
Select the smart card user template you have just created and click Next or Enroll. Enter the smart card Pin and click OK.